There goes the theory that Hawaii cannot have explosive eruptions. That was a fairly sizable one right there. This definitely seems new from a geology perspective, as this may be the first instance of an explosive eruption there that I can think of. On a geologic time scale, the reliable record of eruptions in Hawaii is minuscule. This was likely a result of a lava plug and not a change in the magma composition (andesitic and rhyolitic magmas tend to be explosive type in addition to volatiles such as water being introduced). Guess I used the wrong code embed for those tweets, but the important visual part got through. I'll clean it up for you. You just have to include the tweet url. You can find that by using the image below. Thanks for posting all that info. That was crazy. As I understand it, that wasn't the expected big blast; HVO said last night that seismicity was ramping up a bit again. So far, no repeat, but lava fissuring and flows began again in the East Rift Zone last night. Kilauea is so big that it can have two eruptions some 25 miles apart! I don't know where this flow is, but occasionaly you can see little figures in the foreground running around. Those are people, and that's a forest in front of the lava. That's the scale of the thing. Looks like the fresher, hotter material has reached the surface there. Just in case it's needed, they say, the National Guard has been practicing mass evacuations. Hopefully, it won't get that bad. 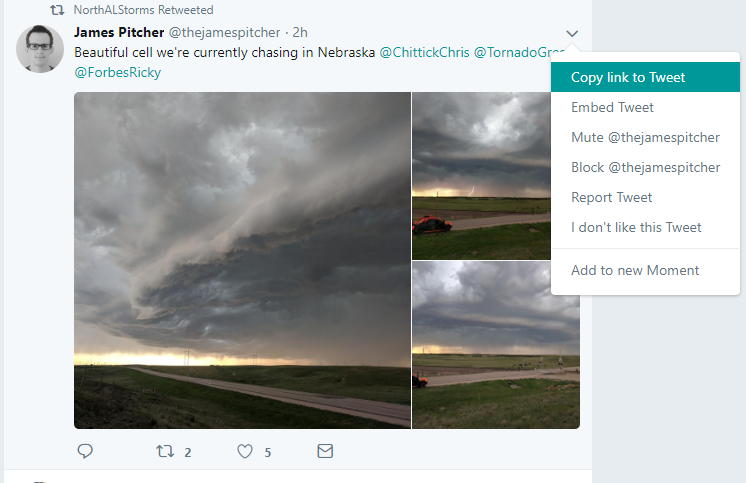 It's a local magazine, but the USGS is tweeting the link, hoping to keep people safe. People just walk up to this stuff! It's astonishing, and dangerous because of very high gas levels. This afternoon, too, there's a lot of explosive activity. At the summit, seismicity dropped for a while after yesterday's explosion, but per the report this morning, it has begun to pick up again, though there's still just the usual steaming coming from the summit crater. First known injury from Kilauea. Eruption of lava continues in the area of Leilani Estates and Lanipuna Gardens. Fissure 22 continues to erupt lava that is flowing southeast to the coast and the lava ocean entry. Fountains at Fissures 6 and 13 feed lava into a channel that reached the coast yesterday forming a second ocean entry. Fissures 7 and 21 are feeding a perched lava pond and pāhoehoe flow that has advanced eastward covering most of the area bounded by Leilani Blvd, Mohala St., and the fissure line. Fissure 17 continues weak spattering, while Fissures 19 and 23 are no longer active. HVO field crews are on site tracking the fountains, lava flows, and spattering from multiple fissures as conditions allow and reporting information to Hawaii County Civil Defense. Volcanic gas emissions remain very high from the fissure eruptions. Magma continues to be supplied to the lower East Rift Zone. Earthquake activity continues, but earthquake locations have not moved farther downrift in the past few days and the number of located earthquakes remains low. An explosion was detected from the summit Overlook Crater just after 6:00 pm that produced an ash cloud that rose to 10,000 feet above sea level and carried slightly more ash than most recent explosions. The National Weather Service Nexrad radar tracked the cloud for 15-20 minutes. Moderate trade winds were blowing to the southwest and light ash fall likely occurred in downwind locations. Earthquakes in the summit area continue at a moderate rate, as does deflation of the summit region. The earthquakes and ash explosions are occurring as the summit area subsides and adjusts to the withdrawal of magma from the summit. Additional explosive events that could produce minor amounts of ashfall downwind are possible at any time. Volcanic gas emissions at the summit remain high. Overnight, field crews confirmed that the fast-moving flow that broke out at about 7 PM HST Sunday night originated from Fissure 8. The fissure fed a channelized flow that moved north along the margin of the existing flow before turning east and crossing out of Leilani Estates near the intersection of Kahukai and Hookupu streets. As of 8 AM HST Monday morning it had started to cross Pohoiki Road, but the advance rate slowed from hundreds of meters (yards) per hour on Sundaynight to a few meters (yards) per hour this morning. Fissures 6/13 are inactive, and Fissure 9 is reactivated but erupting small amounts of lava that are pooling nearby. Fissure 7/21 are no longer active and lava flows from that fissure have largely stalled on PGV property. Volcanic gas emissions remain very high from the fissure eruptions. If a forecast shift in wind direction occurs today, widespread vog may be expected on the Island of Hawaii. 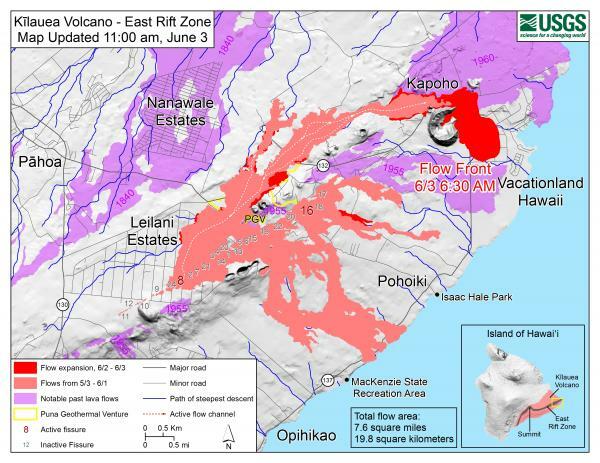 Magma continues to be supplied to the lower East Rift Zone. Earthquake locations have not moved farther downrift in the past few days and the number of located earthquakes remains low. Ash continued to erupt intermittently from the vent within Halemaʻumaʻu crater, at Kīlauea's summit. A brief emission event at about 4:35 AM HST this morning sent ash to about 10,000 feet above sea level but was not associated with a significant tilt offset. A similar event at about 6:30 AM sent ash to approximately 12,000 feet above sea level. Earthquakes are currently occurring at high rates in the summit area. Observations from the ground, by UAS, and by satellite during the past week have documented retreat of the summit vent walls due to collapse of the steep conduit and rim. Trade winds are causing ash fall to the southwest. If a forecast shift in wind direction occurs today, ash fall may occur in communities around the summit area. Earthquakes in the summit region continue as the summit area subsides and adjusts to the withdrawal of magma. Additional explosive events that could produce minor amounts of ash fall downwind are possible at any time. Volcanic gas emissions at the summit remain high. Per HVO mini-update just now, lava covers " 5.5 square miles (3534 acres). Highest temperature from F[issure ]8 measured today, 2039 F (1115 C)." I saw a reliable report online today somewhere that's as hot as it can get, straight from the mantle. Destruction: 128 structures gone, so far, including over 70 homes. Because lava may soon cut off all the highways, evacuations have also been called in the Kapoho area, according to local news online, where there are some 500 homes. Human effects. Gosh. They basically want people out of the whole lower Puna Distrct. Pahala, Wood Valley, Naalehu and Ocean View. Interagency Vog Information Dashboard at https://vog.ivhhn.org. How does this cat not own the internet. That is amazing! Just hanging out enjoying some kibble while I view the nice lava flows, then this dang human comes and disturbs me. The eruption in the lower East Rift Zone (LERZ) continues with no significant change during the past 24 hours. Fountains from Fissure 8 spatter cone continue to supply lava to the open channel with only small, short-lived overflows. The spatter cone is now 180 ft tall at its highest point, and fountains only occasionally rise above that point. The lava flow front at the coast broadened southward and is now nearly 2 miles in width. Lava is entering the sea this morning on the southern portion of the flow front primarily through the open channel, but also along a 0.6 mi wide area with multiple laze plumes from smaller oozing lobes. Fissure 22 showed weak spattering and tiny flows around the base of the cone. This morning's overflight crew also observed minor incandescence at Fissure 16/18. Pele's hair and other lightweight volcanic glass fragments from the lava fountain at Fissure 8 continue to fall downwind of the fissure, dusting the ground within a few hundred meters (yards) of the vent. High winds may waft lighter particles to greater distances. Residents are urged to minimize exposure to these volcanic particles, which can cause skin and eye irritation similar to volcanic ash. The ocean entry is a hazardous area. Venturing too close to an ocean entry on land or the ocean exposes you to flying debris from sudden explosive interaction between lava and water. Also, the lava delta is unstable because it is built on unconsolidated lava fragments and sand. This loose material can easily be eroded away by surf, causing the new land to become unsupported and slide into the sea. Additionally, the interaction of lava with the ocean creates "laze", a corrosive seawater plume laden with hydrochloric acid and fine volcanic particles that can irritate the skin, eyes, and lungs. At 5:03 p.m. HST on June 25, after approximately 21 hours of elevated seismicity, a collapse explosion occurred at the summit producing an ash-poor steam plume that went undetected by the weather radar. Visual observations suggested the plume rose about 700 ft above the caldera before drifting downwind to the southwest. The energy released by the event was equivalent to a magnitude 5.3 earthquake. Seismicity dropped abruptly from a high of 25-35 earthquakes per hour (many in the magnitude in the 3 range) prior to the collapse explosion down to less than 10 per hour afterwards. Within 3 hours seismicity began to creep up again averaging about 40 earthquakes per hour at the time of this posting. Inward slumping of the rim and walls of Halemaʻumaʻu continues in response to ongoing subsidence at the summit. Sulfur dioxide emissions from the volcano's summit have dropped to levels that are about half those measured prior to the onset of the current episode of eruptive activity. This gas and minor amounts of ash are being transported downwind, with small bursts of ash and gas accompanying intermittent explosive activity. 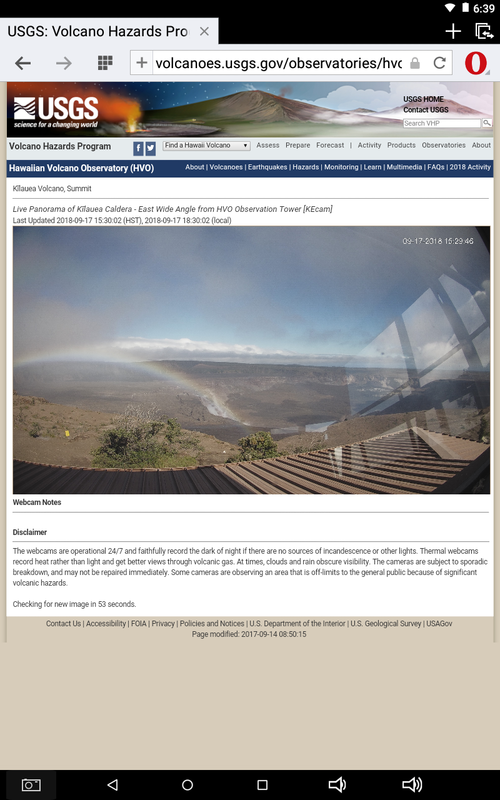 Just captured this rainbow image on one of the Kilauea summit cams from HVO. Seems worth sharing, as the updates have indicated little change and a collapsing lava surface in Fissure 8, where the spectacular fountains were. I so hope that they officially call it over soon, and that the residents of Lower Puna can get fully into recovery. Volcanic Activity Summary: Kīlauea Volcano is quiet. Monitoring data over the past eight months have shown relatively low rates of seismicity, deformation, and gas emission at the summit and East Rift Zone (ERZ) including the area of the 2018 eruption. Accordingly, the Hawaiian Volcano Observatory (HVO) is lowering the Volcano Alert Level for ground-based hazards from ADVISORY to NORMAL. This means the volcano is at a non-eruptive, background state. The Aviation Color Code is also being lowered from YELLOW to GREEN. Despite this change, some hazardous conditions remain and are described below. Kīlauea remains an active volcano, and it will erupt again. Although we expect clear signs prior to a return to eruption, the time frame of warning may be short. Island of Hawaiʻi residents should be familiar with the long-term hazard map for Kīlauea Volcano and how to stay informed about Kīlauea activity. [General hazards] Continuing hazards in areas of recent activity. Importantly, current monitoring data do not suggest a return to eruptive activity or summit collapse in the coming months. However, Kīlauea is one of the most active volcanoes in the world, and additional eruptions will occur. Residents should remain informed of the volcano's status, learn about long-term hazards, and understand how alerts and warnings of volcanic activity are distributed. Despite diminished activity on Kīlauea, hazardous conditions remain in the East Rift Zone and at the summit of the volcano. Steaming ground cracks are especially common just west of Highway 130. HVO continues to monitor these cracks periodically for changes and will do so for the foreseeable future. Some of what emanates from these thermal areas is related to decomposition of vegetation and is not degassing magma. Emissions from these cracks are likely to continue for years and may change with atmospheric conditions and wind. Around fissure 8, thick accumulations of tephra (fragmental volcanic debris) hide underground hazards such as holes, ground cracks, and collapsed houses and water tanks. Winds can pick up glassy and lightweight fragments, including Pele's hair, and carry them downwind. Tephra can irritate eyes, skin, and respiratory systems, so prolonged exposure should be avoided. At the Kīlauea summit, steep crater walls destabilized by 2018 collapse events and earthquakes may be prone to sudden slumping or rockfalls for years to come, even without further ground shaking. Local concentrations of SO2 or H2S (hydrogen sulfide) remain low but people in downwind areas may from time to time notice odors of these gases. As the water table beneath the caldera adjusts to post-collapse conditions and possibly returns to the area of subsidence, it is possible, but not certain, that hydrothermal explosions could occur. From Hawaii County Civil Defense: Hawaii County Civil Defense advises that lava flows and features created by the 2018 eruption are primarily on private property and persons are asked to be respectful and not enter or park on private property. Next Notice: The Hawaiian Volcano Observatory (HVO) continues to closely monitor Kīlauea's seismicity, deformation, and gas emissions for any sign of reactivation. HVO will continue to issue weekly Kīlauea updates on Tuesdays until further notice.